Please Note: This cartridge has many names, 450 Revolver, 450 Adams, 450 Short, 450 Short Colt or 450 Corto. 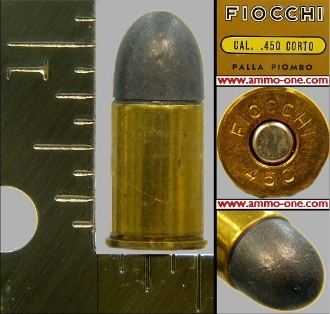 One Cartridge: .450 Revolver by Fiocchi of Italy, older factory loaded with new brass with “FIOCCHI 450" Head-Stamp and a 226 grain lead projectile. Please Note: This caliber in listed in Shoooting ammo, collectible ammumition: Pistol, British, and Military sections. History of the 450 revolver catridge: This cartridge has more names then Carter’s has liver pills. The 450 Revolver, or 450 Adams, or 450 Short or 450 Short Colt, or 450 Corto was the first Center Fire Cartridge adopted by the British Army in 1868. It was used in the Adams Revolver until it was replaced in 1880 by the 476 Enfield Mark I, which was also replace in 1892 by the 455 Revolver Cartridge. Now Obsolete since early 1940s. Accept for a special run by Fiocchi, years ago! You can fire the 450 Revolver in the 455 Webley.